Chinese brush mountains paintings are not simply depict natural views, but reveal the pursuit of spirit and the philosophy of life of painters. It also reflects the inner consciousness for self-cultivation of Chinese which called "Mountain is the model of virtue and water is the good example of character". There are a lot of classic paintings and scrolls are related to the theme of mountains in Chinese paintings, such as paintings of Mountain Tai (泰山), Mountain Huang painting (黄山)( paintings of Chinese Yellow Mountain ), Mountain Hua painting (华山), SongShan painting (嵩山), wooded mountain, chinese fisherman mountain clouds tree paintings, and paintings drawing china temple mountains, etc. Those Chinese paintings of mountains bulid the ideal state of I am the mountain. Chinese Mountain Tai Feng Shui Painting / Chinese Taishan Painting : Mountain Tai (泰山) also called Dai Zong (岱宗) which means the chief of all the mountains. Mountain Tai is always the spirit source of Chinese artists and scholars as well as the symbol of Chinese ancient civilization and belief. According to the Taoism's Five-Element Theory, the god of Mountain Tai directs human's life and death, official's promotion & demotion, and national property. Therefore, over the past 2, 000 years, the sacred Mountain Tai always been the Mecca for emperors. 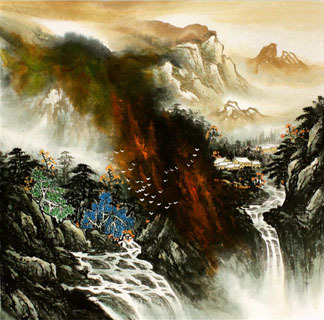 Chinese Mountain Huang Feng Shui Painting / Chinese Huangshan Painting for sale: Mountain Huang (黄山) is often referred to as "the most fantastic mountain under heaven". It is unique in that it seems to possess the best features of all the other famous mountains in China. The great Ming Dynasty Chinese geographer and traveler, Xu Xiake, said of that after he had visited various mountains in China: "I find it no longer worth my while to look at a mountain after visiting the five sacred mountains. No longer do I find it worth my while to look at the sacred mountains after returning from Mountain Huang." And paintings of wooded mountain are mostly express the delight of living in mountain, or the inconceivable appeal of dreamlike landscape, or the detached feeling for living in Arcadia. Each person can find his/her own residence of soul from paintings. InkDance Price: USD 617 /GBP 506 /EUR 587 Sold, you can customize it. InkDance Price: USD 495 /GBP 406 /EUR 471 Sold, you can customize it.